As you've already read, the GOP-led House of Representatives passed a tax reform bill yesterday, with relative ease. Zero Democrats supported the measure, which nonpartisan scorekeepers say would benefit middle class Americans. Thirteen Republicans voted no, almost all of whom represent high-tax blue states; the bill partially eliminates the federal deduction for state and local taxes, which disproportionately benefits those who live in places like New York and California -- effectively insulating them from the consequences from electing tax-and-spend liberals. 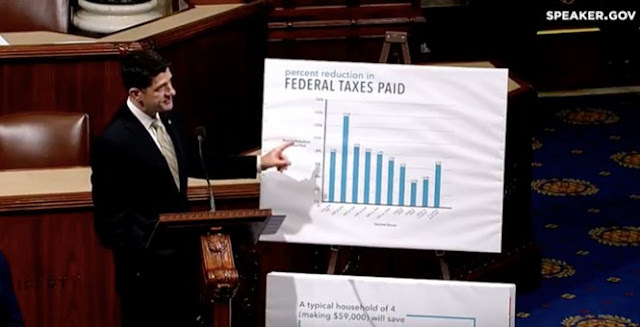 While there are legitimate quibbles about certain elements of the legislation, it represents enormous progress as an across-the-board tax cut, coupled with long-awaited simplification. 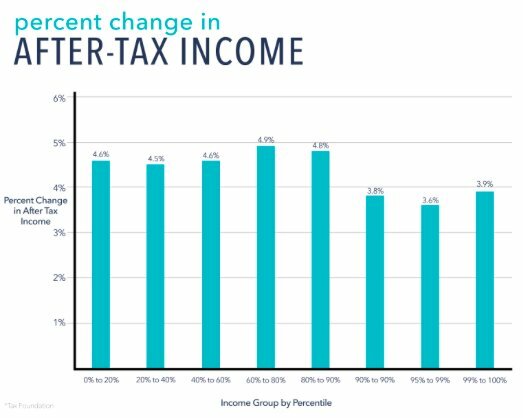 Brackets are consolidated, income tax rates are slashed for nearly all taxpayers (excluding millionaires), and the tax code is made more competitive for many small businesses and corporations. USA Today column mostly attacking GOP tax reform plan includes a buried bullet point on 'winners' under the proposal. 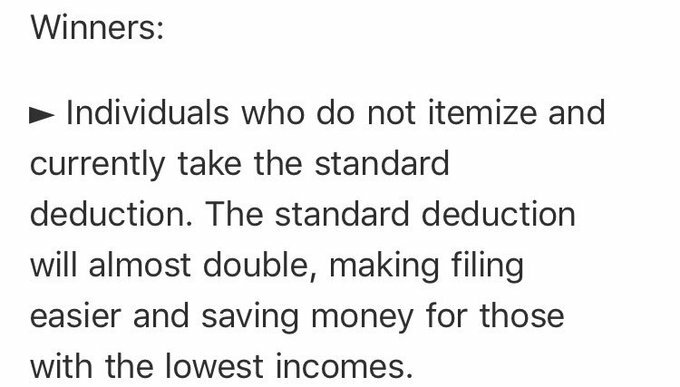 This describes *70%* of taxpayers, a number that's expected to rise to ~90% if the standard deduction is roughly doubled. That's a LOT of winners. That's right: About 70 percent of all US taxpayers currently take the standard deduction, which would approximately double under the House-passed bill. So right out of the gate, the vast majority of American taxpayers already stand to benefit from the bill. 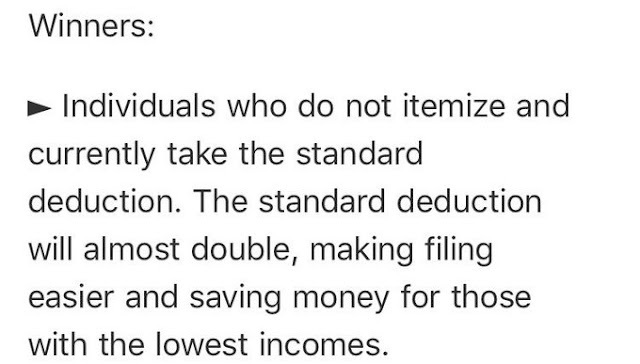 Analysts predict that if the standard deduction increases dramatically, the percentage of filers who claim it (i.e., eschewing itemizing) will rise to the ballpark of 90 percent. A liberal activist on Twitter objected to my argument above, reasoning that some number of the new additions to the standard-deduction-taking ranks would still be worse off than they would be under the current system. I replied by thanking him for confirming that at a minimum, somewhere between 70 and 90 percent of all Americans will be winners under the Republican proposal, and that's without considering the time and money-saving benefits of radical simplification. The cost of tax compliance and preparation runs in the tens of billions each year. As for Democrats' railing against corporate tax cuts, the US corporate tax rate is the highest in the industrialized world, and even President Obama favored lowering it. Democrats were for job-creating corporate tax relief before they were against it. Another argument you'll hear from the Left is that (at least under the Senate bill) the reductions for businesses are permanent, whereas they're temporary for families. But that assumes Congress would allow a huge tax hike on the middle class when the new provisions are set to expire. In other words, if tax cuts are scheduled to sunset in order to allow the legislation to pass muster within the budget rules, that potential sun-setting will only come to fruition if a hypothetical future Democratic Congress chooses to raise middle class taxes through inaction.